My contribution this year to Thanksgiving was making pies. Margo, my baby sister, and I made three pies - a pecan pie, a pumpkin pie, and a vegan apple pie (more recipes to come). We decided last minute that instead of a regular two crust pie, we wanted to make our pie with one crust and then an apple crumble topping. This was a good choice. I only got to eat a piece of it, but that one piece was great. Preheat oven to 350. Combine apple slices, 1 t cinnamon, 2 T sugar, and scrapings from vanilla bean (or 1 t vanilla) in a bowl, then set aside. Roll pie crust out and place in your pie plate. Combine rice flour, pecans, brown sugar, salt and remaining 1 t of cinnamon in a bowl. Pour over melted Earth Balance and stir until everything is fairly combined and clumpy. 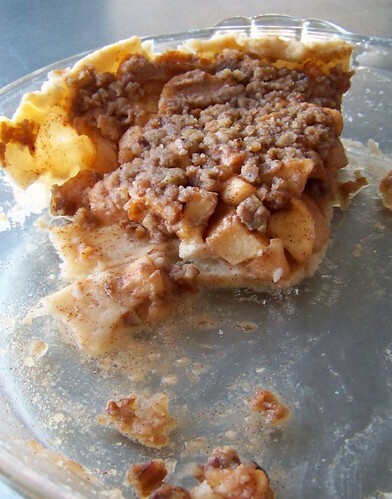 Spread apples over pie crust in pan, and sprinkle crumble topping over. 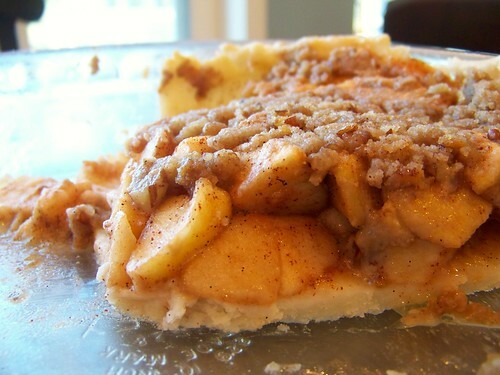 Bake 30-40 minutes until crust edges are lightly browned, apples are softened, and topping is golden. Serve hot with ice cream, or cold for breakfast. *Of course you can use butter and make this not vegan. There is no sad vegan taste to this pie, this is a pie that the gluten-eaters might want to take a piece home with them when they leave, even though(!) it's vegan and gluten-free. Oh my god! I have to make this! I made a crumble using this recipe and it was delicious! Insane! This pie crust recipe is out of this world. Our family's been GF and essentially vegan for 10 years and I've been dreaming of a pie crust like this. Thank you thank you thank you! very discouraged! :'( i made the crust exactly as written and attempted to roll out the crust, it literally crumbled apart each time i tried to lift it off the counter into the pie dish! i managed to assemble bits and enough together to fill the bottom of a crust and then put in the apple mixture and then the crumble topping... very upset about the pie crust though... waiting for the "pie" to come out of the oven now... what did i do wrong? Going to attempt this for Christmas dinner! Thanks so much! Looks delicious! whats the little t in cinnamon call for? and the big T in sugar call for?